Reader’s Choice Award: Congratulations to All of Us! 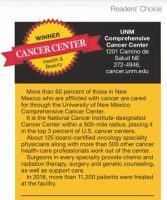 The UNM Comprehensive Cancer Center was named the best cancer center in the Albuquerque Journal Readers' Choice Awards. The Journal announced the winners this week. Thank you for all you do to help our patients!